The other day, I was having a catch with my younger son. It was a warm June night and we were throwing the ball back and forth on the driveway without talking much. My younger son is ten; he's usually pretty chatty. But this night, he was in a funk; his baseball team had just lost the second game of the playoffs. If they'd won, they would have made it to "Family Day," a.k.a the end of season, Little League championship game. Making it to Family Day is as close to nirvana as a fourth grader gets in in our small New Jersey town. My son and I have been playing catch long enough that he knows I'm not good at catching pop-ups and if he throws the ball too hard, I wince. This night, the rhythm of our throws was steady and my mind started to wander. I've been thinking a lot about the connection between exercise, writing and meditation. It had been a long baseball season. For a while, my son's team was losing pretty badly. Their fielding wasn't great and some of the kids kept striking out. My son is a big, strong kid and I knew he had it in him to get bigger hits so I started to meditate a bit with him before his games. Not long marathon Dalai Lama type meditation sessions but just a minute or so of telling him to close his eyes, clear his thoughts and imagine himself hitting that ball out of the park. It worked---for the next couple of games, he got more runs and RBI's. One of the assistant coaches asked what I had done to him. "We meditated before the game." I cringed. I figured the coach, a nice but tough guy from Brooklyn, would roll his eyes. "Really?" he said. "Could you meditate with the kids before the next game?" I learned to meditate in high school. I was supposed to keep my mantra a big, dark secret but I'll just tell you right now, my mantra was and still is "Ima." This is the Hebrew word for mother; it was also the name of the AFS student who was spending the year at our school. That was back in 1980. I haven't been meditating non-stop all these years but a year ago, I read Julia Cameron's The Artist's Way, and in it, she writes, "As artists, we are spiritual sharks. The ruthless truth is that if we don't keep moving, we sink to the bottom and die." In the same chapter, she writes of the zen of sports and moving meditations. "The goal is to connect to a world outside of us, to lose the obsessive self-focus of self-exploration and, simply, explore." I started to think that if I wrote every morning just as I woke up and meditated once the kids went to school, my writing might improve. I started meditating for fifteen minutes every day after I took our dog for a run---not long enough to fall asleep but long enough to calm down and come up with a couple of new ideas for short stories. Strangely, sitting still for a few minutes gives you creative energy that lasts for hours. I don't know exactly what happens to the brain when you meditate, but something lovely and soothing kicks in. In her book, Secrets of Prayer: A Multi-Faith Guide to Creating Personal Prayer in Your LIfe, Nancy Corcoran writes: "During meditation, our brain shifts from beta waves (thirteen or more cycles per second) to alpha waves (eight to twelve cycles per second), a deep internal state of concentration. " This state leaves you feeling calm and purposeful. It's ridiculously easy to meditate: Find a room to be alone in, shut the door, put a cushion or a pillow on the floor, sit down on it, set the timer, close your eyes, concentrate on your breath and repeat your mantra over and over for at least fifteen minutes. If you can't take fifteen minutes, take five, look up, check up the clock, then go back in. Even a minute or two of this focused rest does something magical to your brain. Annie Dillard writes about this process in Pilgrim at Tinker Creek. "The world's spiritual geniuses seem to discover universally that the mind's muddy rivers, this ceaseless flow of trivia and trash, cannot be dammed, and that trying to dam it is a waste of effort that might lead to madness. Instead you must allow the muddy river to flow unheeded in the dim channels of consciousness; you raise your sights; you look along it, mildly, acknowledging its presence without interest and gazing beyond it into the realm of the real where subjects and objects act and rest purely, without utterance." For four games, I "meditated" with my son's team. It was a little bit voodoo, a little bit therapy, and a little bit everything I'd ever read about writing thrown together into a five minute pep talk, which ended with the kids meditating for a minute. The coaches would gather the kids in the dugout and I'd ask each of them to say his or her name out loud and talk about what they did in the last game that they were proud of. I asked them to articulate exactly what they wanted to achieve in the game they were about to play. Then they uncrossed their legs, closed their eyes, and let their minds wander as they meditated for a minute. I watched them as I timed them. Some squirmed, some seemed to doze off but their eyes stayed closed (mostly) and they sat still. At one game, I was late and couldn't meditate with them beforehand, so some of the kids came up individually and asked me to "meditate" them. I did; they won. In fact, they won three out of the four games that started with a meditation. The kids were ecstatic; I started to feel that everything I had learned about writing could also be applied to baseball. And vice versa. Did they win because of the meditation? Who knows? (My younger son, who is standing next to me as I write this, says, "No.") But I think the meditation prompted them to think about what they wanted from themselves in the game. Most of the kids on the team were second and third children. They were used to being told what to do and they were used to being part of large group. How many times in life do you get to articulate what you want to do and then go and do it five minutes later? Second and third born kids rarely have this luxury. Plus, there was the whole "we're a team" dynamic to contend with. Baseball appears to be a team sport but so much of it is individual: Standing at bat, pitching, catching the ball, throwing it, running around the bases. You do all this alone. The meditation had them each imagining what they could do, alone. At one point, I told my sister-in-law, a psychologist, that I was "meditating" the kids. "What are you medicating them with?" she asked cautiously. "I'm not medicating them, I'm meditating them!" I sounded like a ten-year old. The last game was rained out and rescheduled for a day I teach in New York. I taught a a three hour writing workshop, raced to Penn Station so I could make an earlier train, missed the train anyway and made it to the game in time for a rushed "meditation." I was distracted. I can't remember what the kids said or I did. We were playing a team we had beaten before. The final score was 4-3. If a couple of plays had gone differently, we would have won. Of course, meditation can't perform miracles; sometimes the other side is just luckier. Who knows? Maybe they had been meditating too. 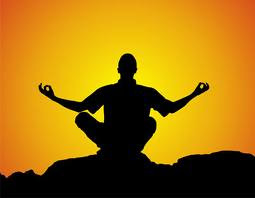 This may all sound like hokum but meditation does tap into a mysterious part of your brain, which yearns to be touched. Believers in God might argue that the Divine Spirit resides there. I'm not particularly religious but it could be. Meditating does summon something approaching bliss; just remembering that you meditated this morning will bring you a wave of peace this afternoon. Next time you prepare to do something that takes courage---writing, painting, acting, competing, performing---close your eyes, clear your mind and breathe in and out. Repeat your mantra. Keep a notebook nearby. When you're done, write down everything that flew in and out of your mind. This conscious resting is what your mind wants to be doing, and your brain will thank you by giving you a generous and unexpected gift.